Arsenic contamination of groundwater in Bangladesh poses a major environmental health hazard to millions. The efforts of public health programmes to address the problem have often been short-lived and unevenly distrib- uted. The crisis represents a failure of governance and a structural injustice of global dimensions. Rights-based approaches to development have been proposed to address such problems. This paper explores the implications of framing the arsenic problem in terms of social justice and human rights. It describes the efforts of the Arsenic Mitigation and Research Foundation to implement drinking water supplies and health support schemes with marginalised communities. The approach was never explicitly framed as rights-based, but focuses instead on social mobilisation and on securing fundamental human needs. We argue that this will be conducive to social justice, which in turn creates the necessary space for pursuing human rights claims. For the full publication see: Rammelt, C. F., Masud, Z. M., Boes, J., & Masud, F. (2014). 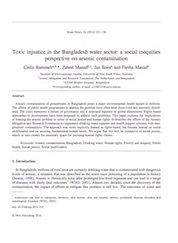 Toxic injustice in the Bangladesh water sector: a social inequities perspective on arsenic contamination. Water Policy, 16(S2), 121–136.